This is one fantastic short story collection! Dedicated to M.R. James, these stories do have a James-ian feel to them that I loved. 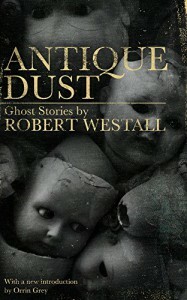 As in James' collection "Ghost Stories of an Antiquary" , these stories have a connecting thread. Instead of finding lost manuscripts and that type of thing, in this book the connecting thread is one Geoff Ashden, a combat veteran and an antique dealer. He is sometimes featured in the tales and sometimes just relating them. "In madness, there are no rules; or you might say the mad make up their rules as they go along and they never bear any resemblance to your rules." Mirabelle is my cat, or rather the cat that drifted in and took me over. "But odd things still happen to people, even though they no longer seem to happen to Geoff Ashden." This collection of 7 stories was excellent. Without being pretentious, this collection packs in the scares and goosebumps along with literary, but simple, language. The stories are diverse and one is not really even a supernatural story, but that didn't matter to me, because I enjoyed all of the tales SO much. I think my favorite story had to be The Doll. Who doesn't love horror stories that feature dolls? This edition has a wonderful introduction by Orrin Grey, which relates some background information about Robert Westall. I found the intro to be an interesting enhancement to this this outstanding collection. My highest recommendation to short story fans, and most especially to fans of M.R. James!